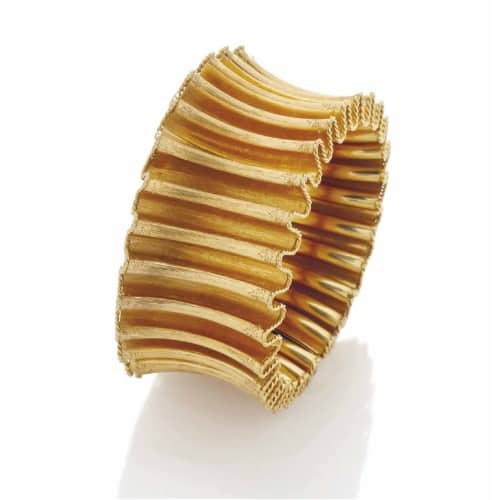 Yellow Gold Fluted Manchette or Wide Cuff by M. Buccellati. Photo Courtesy of Christie’s. Manchette translates from the French as “cuff.” Traditionally designed in pairs, machettes are styled to look like feminine shirt cuffs. Tapering from wrist to forearm, they often include decorations such as buttons and laces to further this association. In more contemporary usage, the term more simply refers to a wide cuff bracelet. In French, the term paire de boutons de manchette translates to english as cuff links.